There is little more satisfying than cleaning your shower glass, especially when it’s quite cloudy and grimy. Once you have it looking clear and sparkling, you can stand back and congratulate yourself for your hard work and effort, and you can actually enjoy your next shower without being surrounded by grime, scum, and mildew. To help you make the most of your time spent cleaning, we have created this detailed guide to washing your shower glass – with all of the latest tips and advice to ensure the process is a smooth one. It’s time to don your cleaning clothes, slip the marigolds on, and grab your cleaning supplies, because we are going to get into every little corner of your shower glass and make it shine. It is so important to make sure you are using the right products when cleaning your shower glass. We also understand that it can be difficult to know if you are making the right choices because the supermarket shelves are lined with so many products it can leave you feeling a bit dizzy and confused. Picking the right product for the job doesn’t have to be hard though, and if you take a moment to read the packaging you will be able to determine which one is going to be right for your bathroom, and you may find the label has some helpful tips for the best results. You don’t even have to use chemicals in order to clean your shower glass, and you might find that natural solutions are the best option for you – something we explore further later on. Soft sponges. These are great for quick cleaning jobs, especially if you are performing regular maintenance on your shower. Make sure they are soft though as any rough sides could damage your glass. Squeegee. We look at these further in the next section, but they are an absolute must in any bathroom, and are able to remove excess water without leaving a mark. Microfibre cloths. Another thing we look at in the next section, these cloths are incredibly soft and gentle on the glass, making them ideal for washing and drying tasks alike. Empty spray bottles. These are incredibly handy to have around when you make your own natural solutions, or if your cleaning product doesn’t come in a spray bottle. It is always a good idea to have two of these hanging around. In my humble opinion, squeegees are one of the greatest inventions when it comes to cleaning your shower, and they work amazingly when finishing off the glass so that you are left with a clear and streak-free look. Are there loads of different types of squeegee on the market? Yes. Do they all work pretty much the same? Yes again. It doesn’t matter what kind of handle or fancy feature it has, they are essentially the same thing, and they will all do an excellent job if used correctly. In order to make the most of your squeegee, you should run it down the length of the shower after rinsing the product of your choice off. This will remove the excess water, but also ensure that there are no streaks once it dries. You just have to remember to always drag it down so that it dries without marks. You can even use them to prevent watermarks and stains from occurring on the glass. The microfibre cloths have been praised for their soft touch and ability to reach even the most difficult and tight areas, but what we also forget is how gentle they are on the glass, as well as how effective they are when cleaning and drying. They can get rid of water spots effortlessly, and provide the perfect finish that won’t leave a single streak should you decide to dry the glass after cleaning. You should always have multiple cloths to hand, and they should be washed once a week. Keeping on top of things every day means that the overall cleaning is much easier and faster in the long-run. So, after your deep clean, you can use a daily shower cleaner to top things up after each daily use of the shower. All you need to do is provide the glass with a quick misting and wipe it down after. You can pick these daily products up from the supermarket, or just use one of the natural concoctions that we take you through a little later. It’s the best way to avoid regular deep cleaning and keep your glass looking amazing. Tesco shower cleaner spray. Using this shower cleaner is exceptionally simple. Once you have had a shower, turn the nozzle on the spray bottle to the ‘on’ position. Once this is done, you can begin to spray a light mist over all of the wet surfaces, including the glass enclosure. After that you just leave it, there is no need to scrub or rinse. It removes limescale from the glass and helps to prevent a build-up of it in the future. 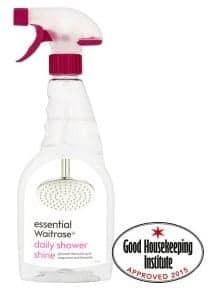 Waitrose daily shower shine. This product works much the same as the Tesco version. Simply spray after each shower you have to prevent the build-up of limescale, soap, and scum on your shower glass. There is no need for it to be scrubbed, wiped, or rinsed at any point (unless you spray too much) and it will not leave streaks or marks if the right amount is applied. Sainsbury’s daily shower cleaner. This nifty cleaner works in the same manner as the other supermarket brands. Spray a light mist after showering each time and leave it. There is no need for scrubbing or rinsing at any point. However, do not over apply it as this could cause streaking to occur. It will prevent the build-up of limescale and other soapy scums, and will also leave the glass of your enclosure sparkling. Plus, like all the other brands, it is very reasonably priced. Now we can get into the ways in which you can create your own daily shower spray, which is especially good if you want to avoid the chemicals found in supermarket brands. Take half a cup of hydrogen peroxide, half a cup of rubbing alcohol, a teaspoon of dish soap, and a tablespoon of dishwasher powder, before mixing it all in a spray bottle. Once all the ingredients are in, fill the rest of the bottle with water and screw the cap on. Then, shake it very gently to combine the ingredients without causing them to foam. Store it away from sunlight, as the sun can cause the hydrogen peroxide to lose its cleaning attributes. There are going to be times when a deep clean is what your shower glass needs, because life doesn’t always give us the option to maintain things on a daily basis. When this happens, you are going to need to put in a fair amount of elbow grease, and you will also find that your squeegee and cloths will not be enough to get it back to a perfectly clean state. A lot of this is because soap scum will have gathered on the glass, which can cause mold in the shower and this is not something that wants to go away without a fight. So, what can you do to deep clean your shower? Use a magic eraser sponge or dryer sheets to gently scrub the glass and get rid of both soap scum and hard water stains. Many people swear by these two items, and they are able to work wonders on several areas in the home – including stained paintwork. Spray the door with white vinegar to break down the soap scum and water stains on the glass. Then, rinse it off and wipe down afterwards to prevent streaking. You can repeat this several times to get really stubborn areas. Use a bathroom cleaner that contains chemicals from the supermarket. These will work really quickly on the scum, and break it down easily. Often, you only need one application, and if your shower glass is in a really bad state, you might want to save a little time by using these. All you need to do is spray, scrub, rinse, and dry. Going for the natural solution can be beneficial for a few reasons. The first is that it is cost-effective, mostly because you are likely to have the ingredients in your cupboard already. Even if you don’t, they cost hardly anything to buy and will last you a long time. It is the most popular home cleaning ingredient, but for a reason. It has antibacterial properties, disinfects, and is able to break down pretty much any kind of grime that dares to invade your home. You can fill a spray bottle with pure white vinegar if you have a really tricky area to clean, or you can dilute it with water if you don’t something quite that strong. Once you have applied it to the glass (leave it for a few minutes on stubborn areas), take a soft sponge and gently scrub the area. Then, rinse it off with warm water, and you’ll be left with a lovely clear pane. This is another formidable and popular product for cleaning in the home, and it really is a force to be reckoned with. If you mix it with water and create a paste, you can make a scrub that will see scum and grime go running in no time. Apply the paste to a soft sponge and then use it to really scrub the glass. Afterwards, rinse it with white vinegar, then warm water, and you can have shiny clear glass. This refers to protecting your shower glass in the long-term, especially if the idea of regular maintenance is not something you feel you can commit to. Obviously, you will still need to clean your shower, but the added protection takes some of the stress away. It can also prevent scum and watermarks from forming because they won’t be able to stick to the glass. Why? Because of the shower screen protector that you can install. Usually, these kits come in packs where you gently rub the protector onto the glass after you have finished cleaning it. These then work for an allotted period of time (depending on the manufacturer) to prevent the growth of scum and watermarks on the glass. You can buy both chemical and natural products as well, giving everyone the chance to choose something they are comfortable with. Application, maintenance, and reapplication tend to be very easy as well. The tracks, or rollers, at the bottom of your shower doors, are the perfect place for grime and bacteria to grow and thrive. Plus, they are so often forgotten about that they can become quite filthy very quickly. Plug up any holes or gaps in the roller tracks so that you are left with a secure trough. Pour pure white vinegar into the tracks until they are filled to the top, and then leave the vinegar there overnight. In the morning, release the vinegar, rinse the area, and wipe the rollers clean. They will be left looking shiny and beautiful without you needed to go to extremes like removing the doors. I hate soap bars, and many others are beginning to realise that they are actually the reason their shower needs to be cleaned so much. This is because bar soap contains talc, and this creates the build-up of scum that overtakes your shower and leaves the glass (and floor) looking grimy, filmy, and generally dirty. If you are insistent on keeping your bar soap, we suggest that you find a brand that does not use talc in their ingredients, as this will massively reduce any build-up and the need for extreme cleaning. Personally, liquid soap is the best way to go for avoiding scum. Then the only thing left to worry about are the watermarks – and there’s no way to stop them from happening. 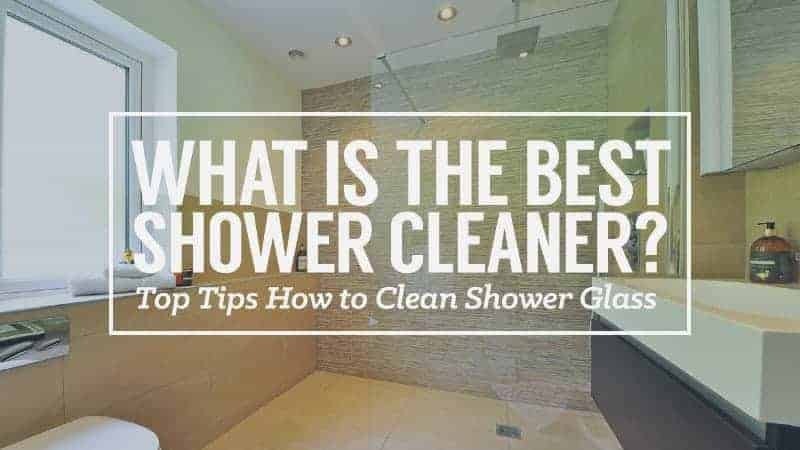 We hope that this guide has been helpful when trying to determine which method is the best for cleaning your shower glass and getting it to look brand new again. There are so many things you can do, big and small, to keep your glass looking fresh, but also to ensure that it is maintained. From chemical sprays to natural solutions, there is a tip for everyone in this guide. All you need to do is grab your cleaning supplies and get to work. What did you think of our guide to cleaning shower glass? Did it contain everything you needed to get the job done, or are there a few tips and tricks you felt we missed? We love hearing from you, so make sure to leave us a message in the comments below.